In fact, the simple answer has a few problems. The internal honeycomb just gives us a similarity between the ice lattice and the crystal form – it suggests that the crystal may develop six-fold symmetry. But just because a crystal may have six corners doesn’t mean it will have six corners. Or, to return to Kepler’s analogy, a beehive also has an internal honeycomb structure, and yet from the outside it appears blobby and nondescript – hardly six-cornered. So, just because the internal structure in snow consists of tiny hexagonal rings doesn’t mean the crystal should look the same when given a turn of 1/6. Indeed, because of the hydrogens, each ring doesn’t even look the same when turned by 1/6. Moreover, to say that the six-cornered nature comes from the hexagonal lattice just raises the next question: How did the lattice get its six-sided rings? It is the “Why 6” question all over again. We’ll address this latter problem first. Why is the lattice hexagonal? 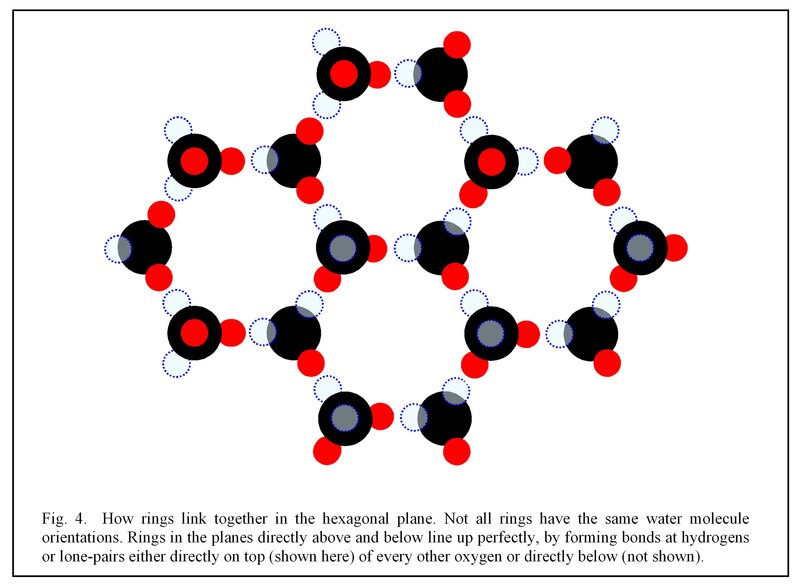 A common answer is that the shape of the water molecule forces the molecules to link up into 6-sided rings. Though true, it seems to conflict with another, little-known fact about water: depending on the water pressure and temperature, water can crystallize into, at last count, 14 other lattices, only two of which are hexagonal. That is, the water molecule’s shape does not always force the lattice into hexagons. But we happen to live under the same conditions that favor ordinary hexagonal ice, also called ice 1h (the ‘h’ standing for hexagonal), and not, for example, cubic ice (ice 1c) or tetragonal ice (ice 9). One could argue that ice 1h is the more natural form, as it requires neither very low temperatures nor any externally applied pressure. So, at least in this ‘natural’ form of ice, the shape of the water molecule produces forces that link the molecules into a lattice of hexagonal rings. But what are these forces and how do they produce hexagonal rings? Wilson Bentley, the farmer-scientist who obtained the first photomicrographs of snow crystals, thought the forces were electromagnetic and in 1910 proposed an electromagnetic water model to help explain the six-cornered nature of ice. The water molecule in his model(3) had two positive and two negative electrical poles plus some lesser “secondary” poles. His basic idea, though quite speculative, was useful. And it was far ahead of its time. In 1933, twenty-three years later, Bernal and Fowler, two pioneering ice physicists, proposed a four-pole model of water to help explain the structure of ice. But their pole model didn’t get much attention until it morphed into the more accurate “tetragonal” four-pole model in 1951. 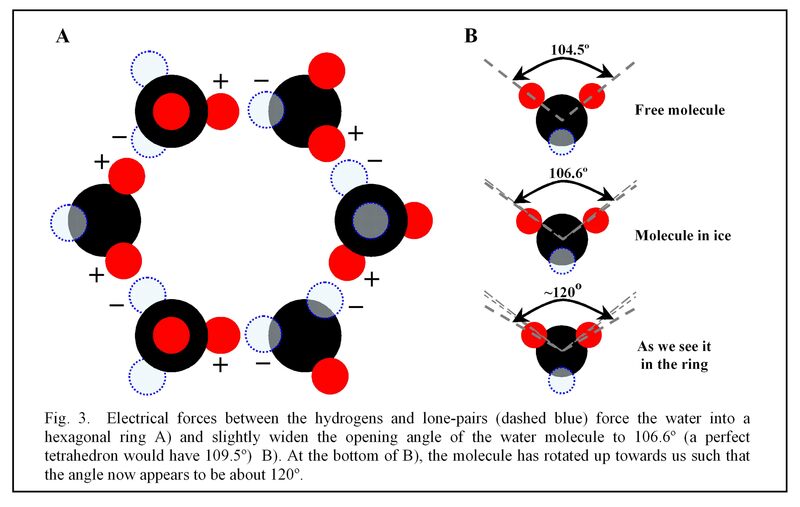 In this model, the two hydrogens are the two positive poles, and the two “lone-pair orbitals” on the other side of the oxygen are the two negative poles, as shown in figure 2. These negative poles, which are predicted by quantum mechanics, are shown as the dotted light-blue spheres. And just as Bentley had included additional secondary poles, later models added poles of weaker charge. In reality, the bonds in ice are the more complex hydrogen bond; nevertheless, the simpler pole model is still used to study ice because it is easier to calculate with. It is also easier for explaining water properties. In this model, the positive pole of a molecule attracts to the negative pole of another, forming a bond; similarly, the molecule’s remaining three poles attract three other molecules. As a result, each molecule bonds to two other molecules in the ring, as shown in Fig. 3A, as well as to a neighboring ring and to a ring either above or below. The ring is hexagonal because the angle between the two poles on a molecule lie close to that needed for a corner of a hexagon. In particular, this angle for a free molecule (i.e., not bound in ice or liquid) equals 104.5º (see figure 3B), which lies just 5º less than the 109.5º needed to be a corner of a hexagon. (This 109.5º is less than the 120º between sides of a flat hexagon because the ring must “crumple” to form bonds to the rings above, below, and beside the ring.) So the tetragonal nature of water naturally leads to a hexagonal lattice(4). As to why the water molecule is tetragonal, the answer involves the quantum electrodynamics of oxygen and hydrogen, and best left for those with much more time. 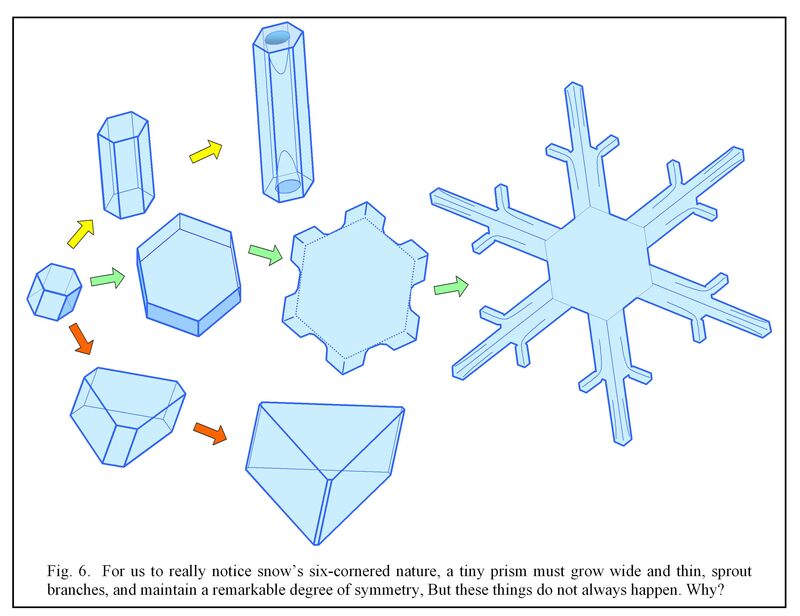 The tetragonal bonding leads to some curious and important properties of ice. The resulting hexagonal structure is relatively open, with large empty spaces in the rings, and for this reason ice 1h (and only 1h) is light enough to float on liquid water. Also, as mentioned above, if we pay attention to the hydrogens, we see that the rings are not really symmetric. Moreover, the hydrogen positions have no order; notice in figure 4 below how each ring is different from its neighbors. This lack of order is important for two reasons. One, it leads to the curious electrical properties of ice – properties that include their being the electrical power source of thunderstorms(5). And more importantly for our quest, the randomness means that the forces produced by any group of rings, after averaging, will be the same when turned by 1/6 of a turn. In this sense, the hexagonal lattice, in contrast to each ring, does have six-fold symmetry. So the water molecule’s shape produces the microscopic hexagons, but how can this affect the surface of a crystal perhaps a million time larger? The answer involves looking at what happens where a ring contacts a crystal surface. Molecules on the surface experience unequal forces – they are pulled more towards the inside of the crystal – but these forces depend on which parts of the rings contact the surface. When only one molecule from each such hexagonal ring lies at the surface, like in the surfaces marked by red dashed lines in Fig. 5 below, the forces make that surface grow relatively slowly. And in the world of growing crystals, the slow-growing faces are the ones that spread out along the crystal, effectively erasing the other faces. It may seem strange, but for crystal faces, the fast-growers essentially burn themselves out and vanish, while the slow-growers dominate. Sometimes it pays to be slow. Because the fast-growing faces get eliminated, the remaining crystal faces will meet at angles of 120º. To see how this works, look again at figure 5. The hypothetical crystal initially has four faces that meet at 90º angles (see A). But molecules in the vapor, upon striking the green-dashed faces, tend to lock into place, whereas those striking a red-dashed face do not attach. But as soon as molecules attach to the green face, new regions of red-face begin to develop (B). Eventually, the new red-dashed faces on either side of a green face meet, and the green faces vanish (C). The resulting crystal now has six faces, all of them intersecting at 120º corners. 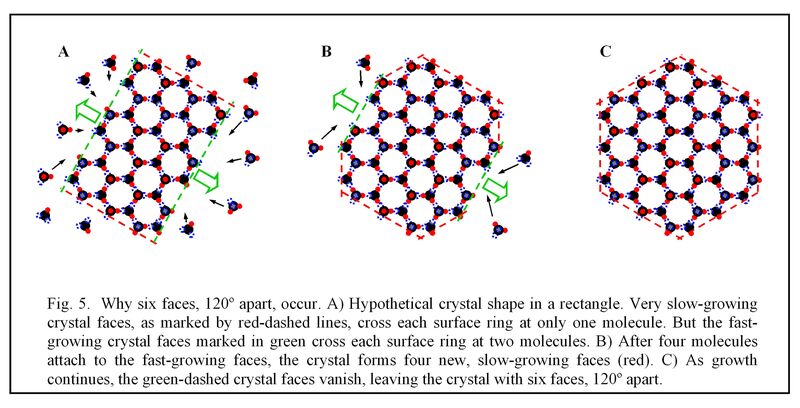 This would happen no matter what the initial crystal looked like: after the fast-growing faces grow out, only the red-dashed type (i.e., with only ring corners on the surface) will remain. The crystal will then have neither more than six, nor less than six faces(6) and all faces will intersect at 120º corners. So this is how the microscopic internal hexagonal rings produce six, and not four, five, or seven sides of the crystal. Now, for the crystal to actually look the same when rotated by 1/6 of a turn, and be big enough for us to notice, a large, roughly symmetric six-pointed star must form. This requires three other things to happen: First, the crystal must grow thin and broad, meaning that the top and bottom faces (not shown in the above figures) must grow much slower than the six side faces. Second, the corners must grow outward faster than the rest of the six faces. And third, each of the six branches should grow at nearly the same rate. As sketched in figure 6, these three things do not always happen. As to why the crystal grows so thin, this was one of the first questions Kepler asked about snow. However, snow doesn’t always grow so thin; for some still unknown reason this happens only within a narrow temperature range. And how the second and third occur has some interesting aspects and unknowns(7) that will be left for discussion elsewhere. But note that whether a crystal is six-cornered and symmetric (green arrows, figure 6), columnar (yellow arrows), trigonal (orange arrows), or some non-symmetric form, adjacent faces always differ in angle by multiples of 120º (or 60º if some faces vanish) for the reasons described above. In 135 BC, the Chinese writer Han Ying noted that the flowers of plants are often five-pointed but the “flowers” of snow are six pointed. Seventeen centuries later, Johannes Kepler tried to explain their six-pointed nature. We now understand the forces that give rise to the six-pointed nature within ice. But why exactly the crystals actually resemble flowers contains secrets that have yet to be revealed. 3)	Duncan Blanchard, The Snowflake Man, McDonald & Woodward Publishing Co, Blacksburg, Virginia, 1998, pg. 147. 4)	This tetragonal nature can also lead to a cubic lattice, with 4-fold symmetry, but it cannot lead to any structure with 5- or 7-fold symmetry; indeed, no crystal can have these symmetries – they are mathematically impossible. 6)	Not always true. For example, the branched crystal in figure 6 shows 90 faces (not including top and bottom). But the most important point here is that the resulting angle between faces are always factors of 60º (usually 120º, but sometimes a face can be eliminated as in the bottom example of figure 6). jnelson This entry was posted on March 15th, 2011 at 10:31:13 pm by Jon and is filed under Snow Science. Wonderful articles, truly illuminating. Thank you, thank you, thank you! You are very welcome. And thanks for the feedback – it’s really nice to hear! good informative article. thanks for your work and willingness to share it, grace to you in your further exploration into the marvelous designs of the Master Designer. And there’s so much more to explore. You have done a very nice job here, especially regarding the history of science, and how an educated and open-minded person, simply observing and trying to figure out what’s going on from ice crystals in snowflakes in terms of molecular structure at the atomic and subatomic level, can indeed have great insight, as did the farmer-scientist, being years ahead of his time, and not encumbered by current facts. Great stuff here to perhaps inspire aspiring young scientists to learn about how to do science without being attached to “how things are supposed to be” . . . as did Michael Faraday, thereby leading to some great discoveries with experimentation, observation and analysis at it’s core. Thanks Al for the insightful comments. The farmer-scientist Wilson Bentley was certainly amazing in his accomplishments, particularly given his circumstances, but sadly underappreciated, even now. I was disappointed to find some years back that he wasn’t even mentioned in the Encyclopedia Brittanica. Whenever I think I know how things “are supposed to be", I find some exception. It certainly keeps us thinking!